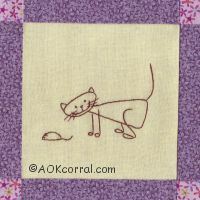 Adorable set of three cat embroidery patterns to stitch onto a quilt, pillowcase or other embroidery stitching project. The Easy Print Version contains all the instructions and design patterns. © Copyright 2010 by AOK Corral Craft and Gift Bazaar All rights reserved. Print out the pattern you want to use. Turn the pattern over to the wrong side and hold it up to a lighted window or lay it on a light box and trace over the lines with your heat transfer pencil. Cut out the muslin fabric to your desired size and lay it onto your ironing board. Preheat your iron to the cotton setting. Place the pattern onto the fabric, with the transfer pencil side on the fabric, position carefully and then press with the iron for 20 to 30 seconds. 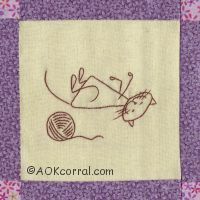 Stitch the design using the Stem Stitch (shown below) with 2 strands of embroidery floss. The whiskers should be stitched with only one strand of floss. The open eyes are made using French knots with 2 strands of floss, wound 2 times. 1. Send your needle up from below on your stitching line and then back down again to make one stitch. 2. Send your needle up through your stitching line again one stitch distance from where your needle went down on the last stitch. 3. Now, go back toward your previous stitch, send your needle down just past the end of the last stitch on either the left or the right side. 4. Follow steps 2 and 3 repeatedly along your stitching line. Stay consistent on either the left or the right side of the previous stitch. © Copyright 2010 by AOK Corral Craft and Gift Bazaar. All rights reserved. 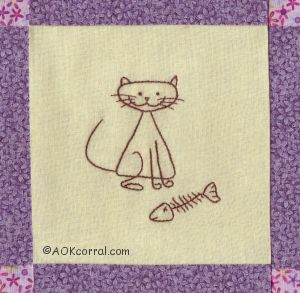 *This version includes all 3 different cat design patterns and instructions for stem stitch.